Crush Filter, Software Filter from ViaDSP. Only a few days after release, ViaDSP has already both updated Crush Filter to v1.0.1 and lowered its announced price. Changes include fixing a couple of bugs with the Saturation, and another bug specific to the MAC installer. To update, users should re-download the installer using the link provided in your "Delivery Information" email. The intro price is also now said to be $19 instead of a future full-price of $30 (in both case this is lower than the previously announced figures, which according to ViaDSP resulted from a mere typo). And for those who missed the previous announcement, Crush Filter is a plugin featuring a combination of LowPass/HighPass filter and BitCrusher, said to be useful to create gritty distortion effects and give motion in combination with the envelope follower. 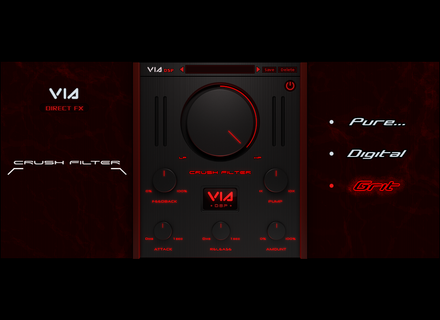 Formats available include Windows/OSX VST/AU (32/64bit), more information available at www.viadsp.com. Special offers at Two Notes Until the end of October, Two Notes Engineering offers special deals including discounts and free cabinet simulations. Permanent price reductions on two Softube products Softube has decided to permanently reduce the prices of its Valley People Dyna-mite and Metal Amp Room plugins. MeldaProduction's special offers for this week This week, MeldaProduction offers 50% off five of its plugins.